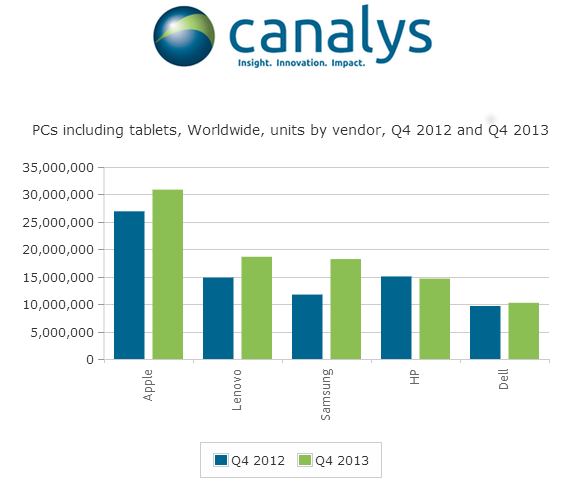 According to the latest numbers from analyst firm Canalys, the worldwide PC market grew 17.9% during the fourth quarter of 2013, with tablets representing 48.3% of the total market. Global tablet shipments grew 65.2% year-on-year to reach 76.3 million units with Apple remaining the market leader, shipping 30.9 million units to take a 19.5% share of the global PC market. Apple shipped 26.0 million iPads, which accounted for 84.3% of its total shipments in Q4. The company’s share of the overall tablet market increased sequentially from 27.3% to 34.1%, with the launch of the iPad Air and iPad mini with Retina display providing a much needed boost. However, Canalys notes that the competition is mounting and Android tablets are falling in price, which will put pressure on Apple’s market share in 2014. Lenovo secured an 11.8% share in Q4, narrowly holding onto second place. Samsung continued to grow strongly and took third place, shipping 18.2 million units. Tablets accounted for 79.7% of its Q4 PC shipments, some 14.5 million units, up 90.3% on Q4 2012, making the Korean tech giant a clear second in the tablet market. Research analyst Pin Chen Tang said that Android is now the most popular OS in the tablet segment, with PC vendors showing a keen interest in Chromebooks especially in the education sector.